Latest jobs Notification is out for the 12th pass candidates who are wishing to work for Odisha Police department as a constable. 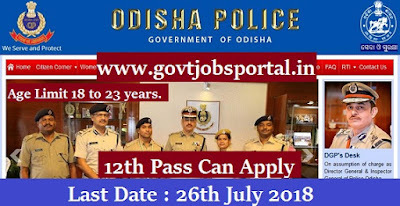 Online Government job applications are invited from Police department for filling up the vacant positions of constables under Odisha Police department. Police recruitment department said that there are total 1722 vacant posts of constable in Odisha Police department in various police stations, which are going to be filling up through this police recruitment process 2018. More information about these Police jobs in India is given below in this article. Read the whole article carefully before applying online for this Police recruitment process 2018. What are the Eligibility Criteria for this Police Vacancy? Indian candidates who have passed in their 12th class examination in any stream can apply for this Police Vacancy 2018. Those who are wishing to apply this Police recruitment must have age in between 18 to 23 years for applying. What is the Physical Measurement for this Police Recruitment? What is the Application Fee for applying this Police vacancy? Pay the Examination Fee through Challan. How to Apply for this Odisha Police Vacancy? 26th July 2018 Last Date for apply online.